Pictued from left are Pam Grant, President of Harrogate in Bloom, Mayor of the Borough of Harrogate Coun Anne Jonesand Tim Axe, Partner LCF Barber Titleys (s). Harrogate law firm, LCF Barber Titleys, is the latest company to join Harrogate in Bloom’s ‘business buddy’ scheme as the town bids for the title of Champion of Champions in this year’s Britain in Bloom awards. Staff have volunteered to adopt the busy pedestrian passage between James Street and the Market Place by weeding, sweeping and generally making it look spick and span ready for the Royal Horticultural Society judges who will be in town on August 1. Tim Axe, a Partner at LCF Barber Titleys, said: “We are the solicitors for the Harrogate Flower Shows and we understand that the town relies heavily on its floral reputation for tourism and its wider economy. "Harrogate residents and businesses recognise we have a council that sees the value of investing in its parks and gardens but, like all local authorities, its resources are reducing. "It’s heartening to see the support provided by Harrogate in Bloom, which consists of eight hardworking volunteers. The idea for a ‘business buddy’ scheme was suggested by Harrogate’s Mayor, Councillor Anne Jones, when she attended a business seminar held by Harrogate in Bloom in May. 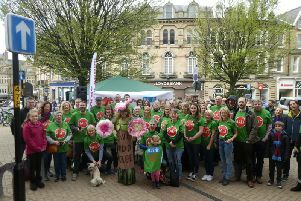 The aim of the get together was to encourage businesses to support the ‘Rooting for Harrogate’ campaign and also derive commercial benefit from the town’s In Bloom successes. Harrogate is one of just seven towns in the country chosen by the national judges to enter the elite category of Champions of Champions and the only town in Yorkshire. The judging day is on Yorkshire Day, August 1. Pam Grant, President of Harrogate in Bloom, wants the town to really shine. She said: “We are grateful to Tim and the team at LCF Barber Titleys for their support. "The ginnel is bedecked with beautiful hanging baskets, but is looking a little shabby at ground level. "We will be taking the judges from James Street, cutting between shops Accessorise and East, to meet James White, Manager of the Victoria Shopping Centre, who is one of a number of businesses also supporting our campaign. The 2017 Britain in Bloom winners will be announced on 27 October at the awards ceremony being held in Llandudno.